In the ever-changing baseball stadium scene, teams are one-upping one another in the category of “things you’ve never seen before at a baseball game.” In this update on the new Marlins Stadium in Little Havana, I’m happy to report the Marlins just joined the big leagues of innovation and have announced that there will be two large aquariums behind home plate. 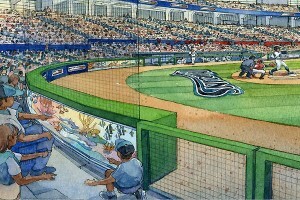 Below is a rendering of the latest innovation in ballparks…. Will this innovation alone be enough to attract fans? Sure, it will certainly bring people there once to see it in person, that’s for sure. As far as the Miami location, that definitely helps as well. The retractable roof should also bring in more fans, and of course, with new talent such as Mike Stanton, the rookie sensation called up last week, the Marlins are PRIMED to get more fan support as well as national exposure. One of the most frugal teams as far as spending money on free agents, the Marlins have won two World Series titles in their rather short existence. That, coupled with management who grooms talent well and seems to have a knack for making good trades, should help the Marlins boost revenues and enjoy much more success in their new facility. With other small market teams such as the Twins getting a new Stadium, a new facility for the Marlins made sense. Miami is a huge tourist destination, and a primetime facility like the new Marlins ballpark should only boost revenues and keep people interested in visiting. When you have visiting teams in town such as the Mets, Phillies, and Braves, their fans are more prone to visit Miami and see the new facility as well as spend a few days around town enjoying all the Miami area has to offer.